Late last week I caught up with a few dancers from the Dance Queens dance festival, currently underway here in SL. There are several acts over two weekends, showcasing various acts and dances, that (while not my thing in particular) should be quite the spectacle to visit, given the sheer amount of effort put into putting on such a thing. I caught up with Medora Chevalier and Trill Zapatero, and sat down for a little interview when they had some free time in their schedules. Medora Chevalier: "This is the staging made by Trill Zapatero, based on her split screen and SL9B build - the Apocalypse will not be televised." Xymbers Slade: "Not bad (smile)." Medora Chevalier: "It's beautiful (smile)." Xymbers Slade: "So this is where the dancing's going to be then? (smile)"
Medora Chevalier: "Call this a staging! No - it is over on the sim for the Dance Queens Festival... different acts are at different places over this weekend and next." Xymbers Slade: "Well, that answers my next question then, I was going to ask when it was being held. Is it all interpretative dance, or just a simple social gathering?" Medora Chevalier: https://docs.google.com/spreadsheet/ccc?key=0AohZI4XRY-bwdDRldi1sMkhTVl9wOTJfQlQ3NEZIdHc&pli=1#gid=0 , "Interpretive." Xymbers Slade leafs through the schedule ... "Neat stuff, for sure. How long have you been doing this sort of thing?" Medora Chevalier: "Well as dancers this is sheer luxury working with an artist of Trill's stature, and the wonderful collaborative music of Jana Kyomoon & Junivers Stockholm. I've been doing dance choreography for shows since the Rings with Carp in 2008." Trill Zapatero: "And the WALL, and Alien Bolero 2 years ago, that was a major big time extravanganza!" ( blushes) , "we've been friends since forever!" Medora Chevalier: "Trill is a huge inspiration!" Trill Zapatero: "Medora is a huge inspiration!" Xymbers Slade: "Dance was always lost on me, I'll admit, I take it Trill's far more well known then, or is a big name in this? Color me ignorant." Trill Zapatero: "I brag about her to everyone." Medora Chevalier: "Well, Trill has been a well known artist for ever in SL." Trill Zapatero: "Trill spends too much time online." Xymbers Slade: "I think we all spend too much time online. 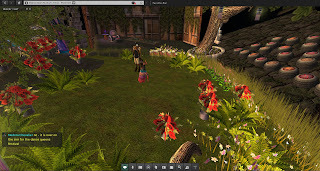 (grin)"
Medora Chevalier: "Well I didn't really choreograph it, but I did perform... and Follow the Light - big live music and particle show with dancing with Junivers again." 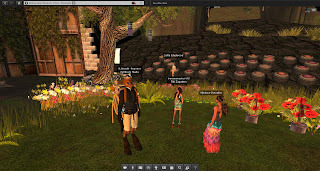 Trill Zapatero: "That was probably one of the most amazing happenings ever in SL." Medora Chevalier: "We like extravaganzas (smile)." Trill Zapatero: "Yesss, with all kinds of spectacle and particles." Xymbers Slade: "How much work goes in to putting on one of these productions?" Medora Chevalier: "Well, Trill has been building for a long time for split screen - how long did it take you Trill?" Trill Zapatero: "This is a modified part of that build, that took me about 2 months and some." Medora Chevalier: "Jana and Juni have been building up their collection of collaborative music over the last year." Trill Zapatero: "But modifying this didn't take that long." Medora Chevalier: "And I choreographed over about 3 weeks." Xymbers Slade nods, "Always nice to 'build on the shoulders of giants'... or at least stuff already established... (smile)." Medora Chevalier: "But Bolero - Ravel arranged Stockholm - that took me about 3 weeks to choreograph originally." Trill Zapatero: "Well the theme really fit what Medora had in mind." Xymbers Slade: "So what are you currently up to? I did hear something about this Dance Queens thing. And what's next after this? Do you have something in mind?" Medora Chevalier: "Well it's a dance festival." Medora Chevalier: "But all of us like work that has a message." Xymbers Slade: "Aha, so something with morals then? (smile)"
Medora Chevalier: "And the message for this is, that when civilization collapses under the weight of the banking and ecological and injustice crises, there will still be beauty, humanity and love." Xymbers Slade: "There's an 'Occupy' joke in there somewhere but I'm not going to be the one to make it." Medora Chevalier: "The important things are not those we buy but those we give." Medora Chevalier: "It goes beyond any single campaign and to the heart of what it is to be human." Xymbers Slade: "Are you expecting large turnout for this?" Medora Chevalier: "Well I guess we would like to have a full audience." Trill Zapatero: "A show for friends." Medora Chevalier: "Though the time is quite early for our usual fans." Trill Zapatero: "40 is our capacity." Medora Chevalier: "They know that we always dance and create for change. The show is called Dance for Change. We believe that the connections between people of different nations, ages, races, languages in this space is how we build positive connections... a web of light." Xymbers Slade: "What's the toughest part of doing it all? The one necessary part that needs to be done but makes you go 'we could do without this if we cut corners' ?" ... Although I get the sense you don't cut corners at all, with the amount of work I'm seeing here in the background." Medora Chevalier: "Well - I guess getting everything blended together in harmony." Trill Zapatero: "Are we any where near 'minimalists' ?" Medora Chevalier: Choosing the dances well - there are over 100 for 45 minutes... and making sure the dancers place themselves where they complement the build." Trill Zapatero: "Minimalism is so last week." Xymbers Slade: "Do you program your own dances in or do you hire other help to work with that?" Xymbers Slade: Xymbers Slade doesn't know the first thing about dances/animations. 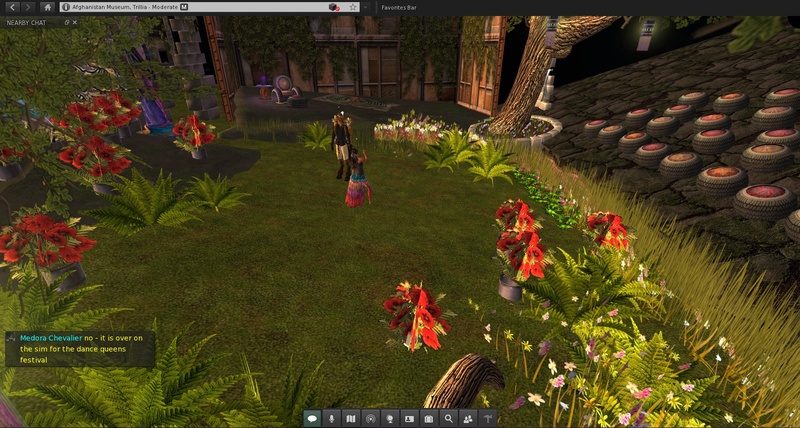 Medora Chevalier: "We use dances from the mocap studios in SL, but I choreograph them all and I always include some sky dancing and particles... part of the magic of special SL art - not just a copy of real life." Medora Chevalier: "Of course there's always some fingers crossed that the tech gremlins leave us in peace!" Xymbers Slade: "Are you planning on doing anything bigger, like going more than one sim and broadcasting from sim to sim? Maybe for the future?" Medora Chevalier: "Well yes I'd like to..."
Trill Zapatero: "How many sims did you guys use for the WALL?" Medora Chevalier: "In the past for the Wall and the Rings we were loaned 4 sims as the audience was big enough. But that was when the education institutes had more in-world sims. 40 is small." Xymbers Slade: "Oh wow, that was what, 2008, 2009?" Medora Chevalier: "Yes, 2008, but then it was revived and we have a new rock opera that will launch in September, so this is like a nice refresher before that." Xymbers Slade: "A rock opera? Can't say I've heard of a blending of rock and opera as a genre. Maybe I'll slip by and take a look, then." Medora Chevalier: "Well like Tommy, it tells a story using songs as a narrative." Xymbers Slade: "Ok, last question on my little list, what do you hope people bring home from all these dances? (smile)"
Medora Chevalier: "Hope. Hope that even in the depths of the worst crisis our planet and people have ever faced we can use our creativity and our love across the world to pull through and live a better life in harmony." Xymbers Slade: "In these times, hope is something in short supply, I've noticed. Given the time and amount of energy expended into building this, I bet you'll be more than successful (smile)." Medora Chevalier: "We hope so - Trill, Jana, Juni - and all the dancers, We all believe in that and we represent an internationalism: Trill from Canada, Szavanna from South Africa, Sofia from Portugal, me in the UK, Dove and Angelique in the USA, Juni in Sweden. But all in all its our gift to those who come along, given with love and hope. So many countries, and we have to plan around time zones, languages, chat lag and typos, etc." Xymbers Slade: "Rare that I see that kind of co-op anymore, in SL or real life, honestly. It's a nice little 'global effort' you have here (smile)." The schedule can be found at https://docs.google.com/spreadsheet/ccc?key=0AohZI4XRY-bwdDRldi1sMkhTVl9wOTJfQlQ3NEZIdHc&pli=1#gid=0. If you wish to see what kind of dances and things are being put on. Go show them your support and tell 'em I sent you (smile). Dancing isn't my thing personally, so I'm not going to give it a dragon hoard rating, it'd just go right over my head.